When my mom’s mother lived with my folks near the end of her life, and Dad turned on TV for a ballgame, there was a problem. Or I thought there was a problem the first time I visited and witnessed this phenomenon. Grandma Brown believed a person should stand up when the national anthem was sung, even at a remote location. She reached for her walker and slowly rose to her feet and placed her hand over her heart. “Raymond?” she said in an expectant voice. “Yes, Miz Brown.” Dad, a banty rooster of a man, stood and put his hand over his heart. I glanced at them and quickly stood. We remained that way until the end of the song, and then we applauded, and then we sat back down. That’s the kind of person Grandma was. I never conned Jim into climbing out of his recliner to stand when The Star Spangled Banner was sung before a game, but he would call me into the living room to witness it. I rarely knew who was singing, but I stood there until the roar of the crowd at the end. I felt a swell of patriotic pride and nostalgia at the same time. 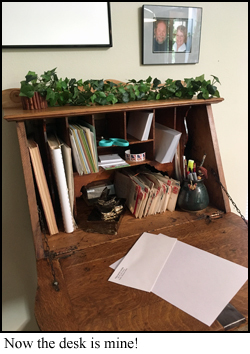 My mom inherited Grandma’s little secretary desk, where I’d seen Grandma sit many times. She wrote a column, “Calla’s Corner,” for the weekly newspaper about the goings on in the small Arkansas town where she lived and where I was born. Our family made the paper when we’d visit from Missouri. “A good time was had by all” frequently ended the two-line mention. Grandma sent birthday cards to everyone she knew. To her grandkids, she’d stick in pieces of gum, taped to a card. She’d write our names on the flat sticks of Juicy Fruit, which meant we had to share with our siblings. There was always postage due on the envelope, for she never learned that the extra weight of gum required an extra stamp. Grandma had an eighth grade education. When she came for my college graduation, she tried on my cap and gown, since she’d never worn one. She would have been a scholar in a different time. I inherited Grandma’s secretary. I kept it for six years like my mom kept it, a shrine to Grandma. 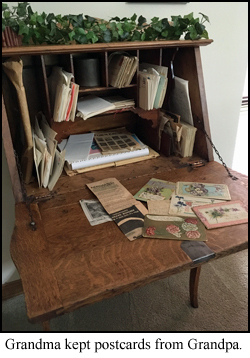 It still held postcards from her courtship with Grandpa well over a hundred years ago. 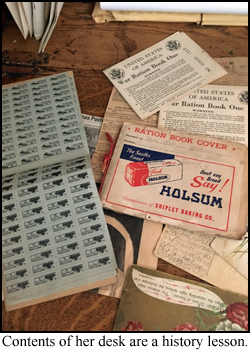 In one cubbyhole I found war ration books, some with stamps still in them. Grandma, who milked cows, tended gardens, raised chickens and six kids, found joy at that desk. I envisioned sitting there, too, writing, just like Grandma Brown. But it’s not a computer desk, and the only things I write by hand are birthday cards that I send out to friends, just like Grandma. So I decided a few days ago to move Grandma’s memories to a well-labeled box (Of course, I would never dispose of these historical documents) and use this desk for myself. I have Jim’s letters to me, and that is where I’ll keep them, just like Grandma kept her postcards from her suitor. This is where I’ll address birthday cards. I will carry on Grandma’s love for this secretary by using it. 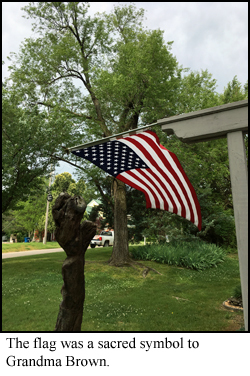 And if I have the TV on for a ballgame (unlikely, although I may turn on the World Series come October), I will stand for the national anthem.